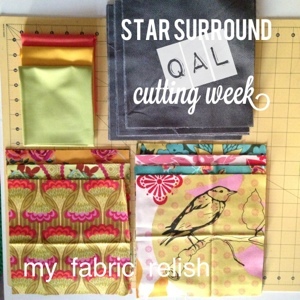 Welcome to my weekly check in post for my Happy Quilting's Star Surround QAL! I will be sure to post my weekly progress here so please come back to see how it's going! 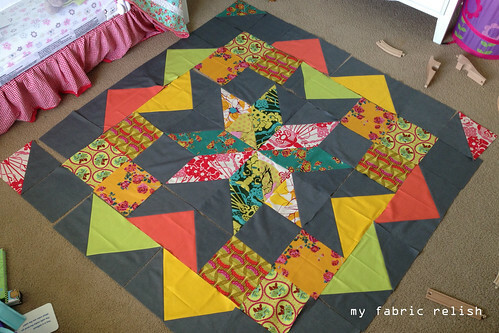 If you don't know yet, I am making my quilt a giant size block at 64" square! I give all the cutting details below! Well, after realizing I didn't have big enough pieces to do the 40" 3x3 lay out I was intending I had to rethink all of my lofty plans. 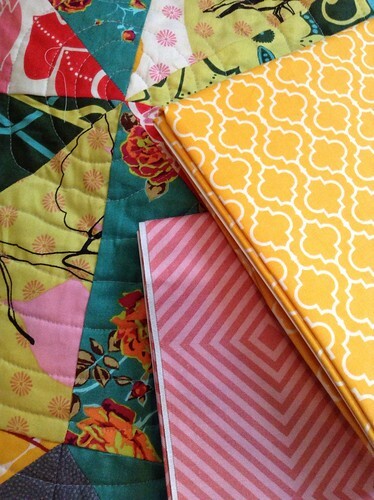 1) I didn't have the heart to cut up the sweet bird prints that made me fall in love with this bundle. 2) I couldn't let go of my Hand Drawn Garden choice but I also didn't want to buy any more. 3) I didn't want to make a baby size quilt (don't need a baby quilt) or make 16 blocks (that's a lot of cutting a piecing!). So......I thunk and thunk and thunk....then I did some math...gasp....and then made a plan! 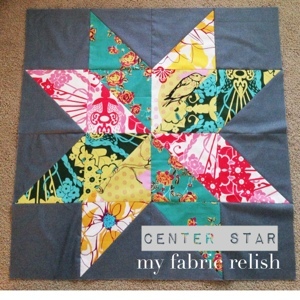 I'm making a GIANT star surround block! Yeah, A GIANT size block! The biggest block Melissa (not me) has configured is a 46 incher. I'm going up two more sizes to 64! It didn't take long to do the math for the bigger size. 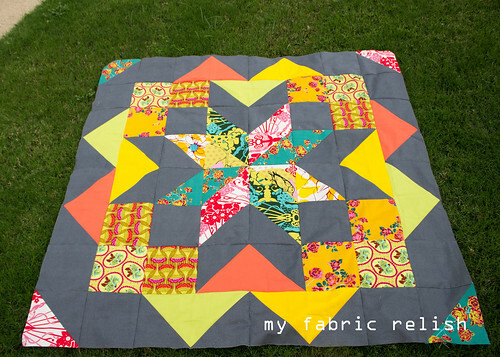 I've been eyeing those big giant block quilts like the one Jeni Baker at In Color Order has a tutorial for and then Amy Smart's version at Diary of a Quilter here. So I thought...two birds one stone! If you are interested in going GIANT, then here is the math for ya (on the picture) but be sure to read below since there is a minor correction! 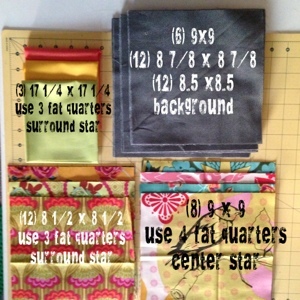 Keep in mind that I'm using a fat quarter bundle to make my block. I am also doing it scrappy scrappy. Not just scrappy like the examples Melissa gives, but scrappy scrappy! UPDATE! You need to cut 10 not 8 for the 9x9 print blocks on the bottom right. I REPEAT, you need to cut 10 not 8 for the 9x9 print blocks on the bottom right. It's really hard to do all the math correctly when you go rouge. Sorry! 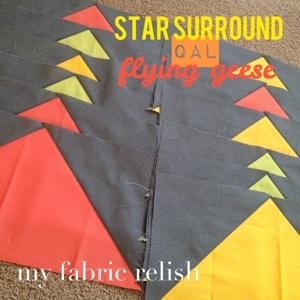 You will need 2 yards for the background fabric...be careful when cutting since it's just enough! And as you can also see, I went with a charcoal grey for background. I hope I made a good decision with both the background and the GIANT-NESS! GIANT is right...Wow! I'm excited to see it progress. Still cutting out mine. I'm going even scrappier so it is taking some extra time to plan. Hope to post some pics later in the week. Yes! I'm kinda nervous I went too big. I hope I did my cutting right too. I think it took a good 2 hours to plan and do math. Good luck with the cutting!! Thanks for your seal of approval...lol!!! Thanks for stopping by too!! It will be perfect! Fabric, check. Colours, check, pattern, check! You are good to go! I think the charcoal background will be just wonderful. It really goes well with your colors. I love the solids for the surround. What a great way to make them pop! Oh ya, I see it now. I love that there is a bird fussy cut in there, that is awesome! This is looking very promising! I love the fabric selections. Love your fabrics, I cannot wait to see the giant version of this. I went with the big quilt and yes 16 squares is SO much cutting and piecing! lol!! 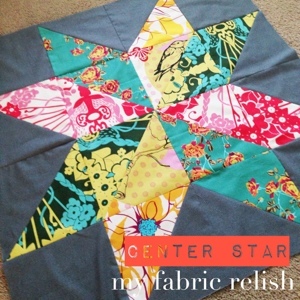 But I am loving seeing all of these different quilts come together! This is really beautiful. I bet your neighbors were just saying, "Wow, look how awesome our neighbor is - so talented to make such lovely works of art!" I want to make this and thank you in advance for doing the math to make this larger size. You said you would have used a print instead of a solid if you had realized that the large cuts were for no waste flying geese. Do you mean you would have used a print so you didn't have to waste fabric? 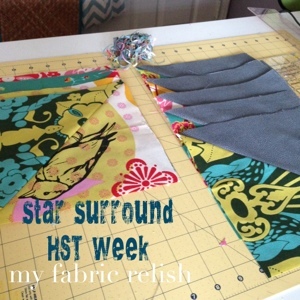 Would you have changed your cutting any if you had used prints instead of solids? Thanks again! Awesome and brilliant! Thanks for doing the math for us! I love the rich colours you're using.